The F-35’s development program will wrap up one year late in May 2018 and require $1.7 billion more than planned, according to a new report from the G.A.O. 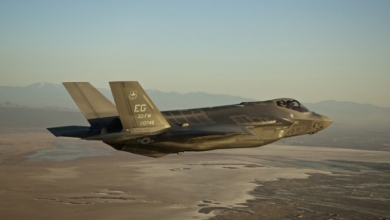 More bad news for the F-35 program. While the ever useful [SECRET] stamp hides the details the basic problem is obvious. The tight integration of an incredibly complex web of interacting software means that a “fix” in one system may create problems in one or more others. Perhaps “may” is a weasel word. “Will” might be more appropriate. We may expect the usual onslaught of nay sayers proclaiming the doom of the program and rah-rahs claiming nothing is wrong. Another couple of billion we can never afford it! the Greek chorus of doom will chant. Nothing is wrong, it is only money we have an endless supply the geek chorus will optimistically reply. Meanwhile, the team of USAF and L-M are at the bottom of a seemingly bottomless pit called the F-35 program determinedly digging. . .
We badly need to have a history of this badly botched program honestly written with a declassified version made public as soon as possible so that all concerned parties are duly embarrassed and their many incompetence’s from the earliest days revealed. This may not prevent another B-2, F-22, F-35 type fiasco, but it might help. Certainly the chimera of “commonality” must be hunted to extinction. There have been a few instances of an excellent airplane being successful as a carrier airplane and an land based airplane. The products of programs to achieve “commonality” always seem to end up uncommon. None more so than the F-35A / F-35B / F-35C. As a nation we need to address the question of how after the F-22 fiasco were the same culprits allowed to burden America with the F-35 fiasco? We need to ensure that it never happens again for the F-35 has cost this nation so much in so many ways in the form of other programs undeveloped, other needs not met. As “huge” tax cuts loom and stupendous deficits lurk in the wings it is clear that we cannot afford another B-2 blunder, another F-22 Budget Raptor, and especially another F-35 Short Circuit II. Unwarranted defense spending doomed the Soviet Union. We have been so busy beating our chest and bragging, blundering into endless wars, and the endless F-35 program; we have not noticed why Putin has so much trouble today trying to get Russia out of the economic hole the communists spent it into.